What do you want out of an MMO? The prevailing wisdom is that players want game developers to shell out hundreds of millions of dollars on creating a world with dozens of automatically resetting attractions like dungeons or raids. Call it the theme park model of MMO design. Unfortunately, investments in building a theme park MMO don't seem to be working anymore, with many high-profile titles like Star Wars: The Old Republic falling below expectations. The post-WoW MMO boom is decidedly over, with only a few still in development here in 2012, but one man thinks the secret to success is to shift away from the theme park model altogether. He believes players would rather participate in a sandbox creating their own content instead of lining up to play what the developer puts in front of them. Ryan Dancey from Goblinworks is busy creating what he calls a sandbox fantasy MMO. "Pathfinder Online is going to be a game where the character's actions are persistent, and the players are going to build large social structures we're calling kingdoms. And players will be the primary drivers of the stories that are told in the game," Dancey said during the successful Kickstarter campaign for the Pathfinder Online Technology Demo earlier this year. "When you accomplish something in the world, that thing will be persistent," he continued. "When you build a structure or slay a big monster or clear out a dungeon in Pathfinder Online, that will have an impact that will be lasting, people will be able to see that structure that you built. And that dungeon will be empty and those monsters will stay dead." You might say Dancey has the ideal resume to make a sandbox MMO a reality. He has a strong background in game design, marketing and strategy that he honed at companies like Wizards of the Coast (makers of Dungeons & Dragons), White Wolf Publishing, and the caretakers of EVE Online, CCP. As he made it his mission to increase the number of EVE Online's subscriptions, Dancey saw firsthand just how many players signed on to interact with that game's corporate machinations. Think about all the stories you've heard of what happens in EVE - from Goon Swarm shenanigans to corporate espionage and exploitative investment schemes. None of that gameplay was created by the developers at CCP - they just provided the tools for the players' own content to form. "One of the things I took away from my time with EVE that was really surprising for me is that there actually are a lot of people who are interested in that non-adventuring lifestyle," Dancey said. "They really do enjoy all that other stuff that goes on in an MMO. And I think that before [working with] EVE, I was pretty skeptical about the size of that population. After EVE, having seen it, I'm not skeptical anymore; I know they're out there. There's just not as much opportunity to participate in the gaming world because no one makes games for them anymore." While Pathfinder Online will certainly cater to those players more than other fantasy MMOs out there, Dancey realizes there will have to be some dungeons, too. He admits EVE concentrated a bit too much on the corporate game, and he plans for Pathfinder Online to have more adventure in contrast. "EVE has a very big emphasis on economic and political structures and not much emphasis at all on adventuring or going up against challenges that are driven by the environment," he said. Dancey wants a game a "little heavier-weighted towards having fun and a little less towards running a spreadsheet." By offering a little bit more PvE content, Dancey hopes Pathfinder Online will be a hit. There have been sandbox MMOs before - A Tale in the Desert comes to mind - but none have broken through to see the kind of success that would make publishers any money. 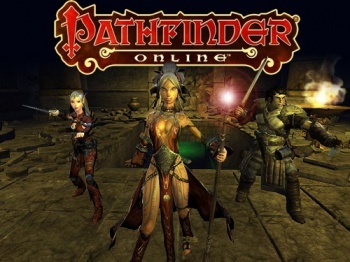 "We'd like to see Pathfinder Online become an evolutionary improvement over the state [of the sandbox] in the same way that World of Warcraft was a revolutionary improvement over the state of the theme park," he said.